While conducting a job search, LinkedIn, as the leading professional networking site, should become your most important and most visible social media platform. As such, it’s worth investing time into making sure your profile is complete and represents you well. Set up a personalized profile URL: linkedin.com/in/yourname. This makes it easier to include a link to your profile in your resume header or email signature. Options include first and last name, first initial and last name, or first and middle initials and last name. Be sure your profile picture is professional. Ideally, your picture should be a head and shoulders image with a solid background. Consider adding contact information (i.e., an email address) to your profile to make it easier for executive recruiters to reach you. Reference all the languages you speak. You never know when a foreign language skill might open doors to a new opportunity. Highlight projects you’ve worked on in your summary. Be sure to frontload your profile with experience as it relates to ‘hot topics’ in the industry or profession – skillsets that other employers may find valuable. Include recent and/or relevant continuing education courses you’ve taken. An area you recently learned about or were certified in could correlate to an area of focus at a potential new employer. Double check that your information on LinkedIn matches up with that on your résumé. Otherwise, it looks like you’ve lied or misrepresented yourself. Review your Groups to remove any off-topic or less-than-professional ones. This is one of those situations where the vibe your profile gives off should be on-brand and adding value to your candidacy for your target job, not accidentally raise a red flag. 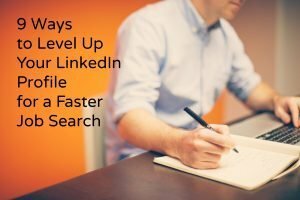 Make sure your profile meets LinkedIn’s definition of “profile completeness,” the criteria for which has changed over time, but generally includes listing your industry and location, an up-to-date current position and a description, two past positions, education, skills, a profile photo, and at least 50 connections. Once you’ve followed these nine tips, you’ll be well on your way to a LinkedIn profile that is a strong reflection of your value to employers.